A DONEGAL WOMAN has been convicted of animal cruelty and told that she cannot keep dogs for two years. The ISPCA said that the Donegal woman was convicted of animal cruelty at Letterkenny District Court today. These dogs were as emaciated as any I have seen in my 14 years with the ISPCA. It is important that those responsible for such severe cruelty are held accountable to send out the message that it will not be tolerated. The Donegal woman submitted a guilty plea through her solicitor Frank Dorrian, said the ISPCA. 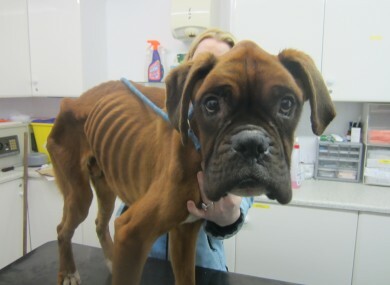 They said that the case is related to a call made by ISPCA Inspector Kevin McGinley and Gardaí to the woman’s address on 15 January 2013, when two emaciated boxer dogs were discovered. The ISPCA said that the dogs were two-year-old brothers and were named Oscar and Elmo by rescuers. The canines were surrendered into the care of the ISPCA and taken for veterinary treatment. The ISPCA said that Judge Paul Kelly banned Gallagher from keeping dogs for two years. He also adjourned the matter until 9 June for final sentencing. It was noted in court that the ISPCA had incurred costs of €652.26. When Oscar and Elmo were rescued, the vets who examined them gave them a body score of just one out of five. The duo went on to make a full recovery at the ISPCA’s National Animal Centre and were later rehomed. Email “This is why a woman was banned from keeping dogs for 2 years”. Feedback on “This is why a woman was banned from keeping dogs for 2 years”.